Business survival in the 21st century requires effective ways to transfer knowledge and train a new generation of the professional workforce. This means we need to make the most of new technologies—not just port 20th and even 19th century learning techniques from the physical classroom onto the web. But adopting new technologies does not mean we should discard the best of time-proven communications techniques. For more than a decade, I ran a successful sales and marketing consulting company. One night, while I was in a hotel room after a long day attending a conference, I decided to watch a TV documentary about 19th century firearms in the hopes that it would put me to sleep. Instead, a few minutes into the program, I was hooked and watched the entire program with complete attentiveness. Here’s the epiphany that came of that experience: If a documentary of no intrinsic interest could engage me so completely, why not apply these same broadcast techniques to virtual training? After months of researching broadcast media studios, visiting media departments at academic institutions, and meeting with other media specialists, we built live virtual training programs that integrate broadcast media techniques with the best practices of training. We chose the live versus the asynchronous approach because of the highly interactive and collaborative possibilities that can come only from live discussion. 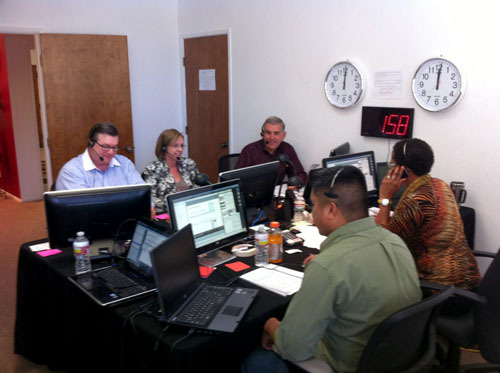 In the past year, more than 600 live virtual training sessions have been produced in our studios. Topics range from management and coaching to sales, leadership, and communications training. 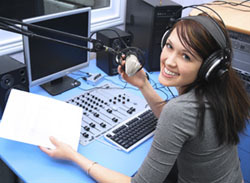 Each 75-minute session is anchored by a host, who is professionally trained in broadcast media. The host is paired with an expert in a particular subject matter. The set also includes a producer, who facilitates live chat and audio input by the 22 or fewer participants. Most training requires 5 to 10 sessions, spread out over a period of a few weeks or months. The limited time and number of participants keeps things lively. In one session, we’ve had participants from three different continents—all in different time zones and with different native languages—conversing by phone and live chat with our host, our subject expert, and with each other. By keeping the content of each session fresh and varied, participants stay engaged and alert. We include multimedia elements, including video, animations, and graphics, and comment on completed work assignments, which are assigned at the end of each session. The trick to building a successful live virtual training program is to be creative. And who is more creative than the entertainment industry? Delivery is the key to success. If you can truly engage your participants, you’re more than halfway there. Adopting techniques from the entertainment industry, such as broadcast media, is a powerful way to engage your audience while avoiding the drudgery of PowerPoint presentations and top-down lectures. Scripting is important, but so is spontaneity. Surprise and variety are definitely the spice and seasoning of any training experience. Pairing trainers with broadcast media professionals experienced in engaging participants is a highly effective way to engage the audience. Collaboration on work assignments creates greater accountability among participants. Instead of using case studies, integrate real-life work projects into your training. With the dynamic, broadcast media-style delivery of our live virtual training programs, 3g Selling knows how to put online training and collaboration platforms through their paces! Recognizing our best-in-class use of the Adobe Connect platform, Adobe recently launched a Customer Success Story about us and how we’re pushing the platform to offer our customers a richer online learning experience. Check out the writeup on the Adobe Connect Blog, where you can also download the Success Story.